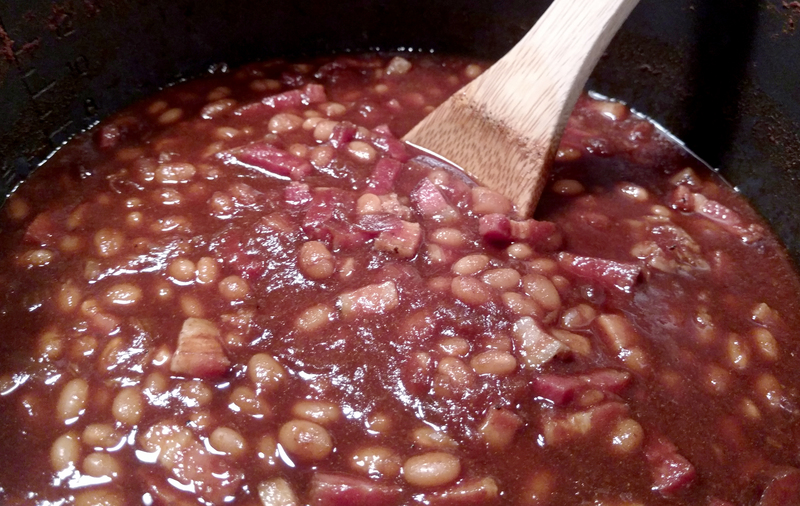 Baked beans are a relatively new addition to my menu, but I found this recipe and it has way more flavor than the cans or any restaurant ones I have tried. Soak 200 g dry navy beans for at least six hours per directions on the bag. Strain and reserve the beans. Combine water, tomato paste, molasses, brown sugar, salt, garlic, Worcestershire, mustard powder, baking soda and black pepper for sauce in the pressure cooker and mix. Add navy beans and onion to the pressure cooker. Cook at full pressure for 25 minutes, when finished, remove the pressure cooker from the heat source and let it cool enough to depressurize. Add the cubed bacon to the baked beans in the pressure cooker and cook again for 3 minutes on high pressure. Stir the vinegar into the baked beans just before serving.